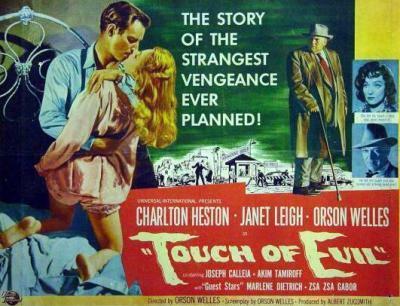 Touch Of Evil, directed by Orson Welles, was the last of Hollywood's initial film noir cycle, bookending a trend that began with The Maltese Falcon. It's an exceptionally dark film; literally so, because several scenes take place in almost pitch blackness. Like all great noir films about high-level police corruption, it has a superb sense of authority and gravitas that it takes great pleasure in unravelling in its conclusion. The opening shot is one of the greatest sequences in cinema: a four-minute crane shot following an American couple as they cross the Mexican border. When Welles was interviewed for This Is Orson Welles, he said that, with hindsight, he disliked the bravura of this opening shot, pointing out that there is another, longer, more complex crane shot later in the film. This later shot, in which the camera moves through several rooms of an apartment, is less flamboyant and therefore, according to Welles, more of an achievement. Famously, the film was altered by Universal against Welles's wishes. Some extra exposition scenes were added, and the film was re-edited behind his back. Welles wrote a long memo to the studio, arguing eloquently against the revised version ("In most cases, I can see, or guess, the point of view which has motivated the change, even when I don't happen, personally, to agree with it"), though most of his requests were refused. In 1976, a longer version of the film was released. This restoration (the version I've seen), while marketed as a director's cut, is more accurately a compromise between the studio's version and Welles's intended vision. It does restore several key scenes originally removed by the studio, though it also retains the non-Welles sequences that the studio added. Finally, in 1998, most of the non-Welles scenes were removed, and the film was re-edited in accordance with Welles's memo. One last point: in Touch Of Evil, Janet Leigh stays as the only guest at an isolated motel, staffed by a nervous desk-clerk; two years later, in Psycho, Janet Leigh stayed as the only guest at an isolated motel, staffed by a nervous desk-clerk. Admittedly, she isn't murdered in Touch Of Evil (in fact, perhaps to appease the censors, it's made unrealistically clear that she is never harmed), though the situation is strikingly similar nonetheless. Woody Allen always maintains that he never plays himself in any of his films, and he finds it inexplicable that the audience jumps to the conclusion that his screen persona reflects his true personality. But let's look at the evidence: in the films in which he stars, he often plays neurotic writers and comedians who live in New York, enjoy jazz music and European films, and are in analysis. In Manhattan, Allen's character, Isaac, defends Ingmar Bergman, Allen's favourite director, as "the only genius in cinema today", and reels off a list of "things that make life worth living" composed entirely of Allen's own favourite things. Revealingly, in Deconstructing Harry, Allen plays Harry as a hard-drinking, pill-popping misogynist - none of which are Allen's own personal characteristics - yet cannot resist also depicting him as a man who avoids smoking dope, which echoes Allen's own attitude though is incongruous for the character in the film. In Stardust Memories, Allen plays Sandy, a comedian-turned-director who, after making a series of comedies, is branching into portentous drama. Sandy is followed everywhere by autograph-hunters and wannabe actors, and harassed for charitable donations. His producer and fans (and even a group of visiting aliens) dislike his latest film, preferring the "early, funny ones". This is an obvious reference to the negative reaction Allen had received for his Bergman-esque drama Interiors, which was stylistically a stark contrast to his earlier, funnier films such as Sleeper. Stardust Memories was not an especially popular film, precisely because of the perceived conflation of Allen himself and his characters. In the film, Allen's fans are shown as invaders of his privacy who misinterpret his work. In interviews, though, Allen makes the very sensible point that, if he really did dislike his admirers, he would not be so foolish as to reveal it in one of his films. Stardust Memories self-referentially represents Allen's perplexity and defiance at the negative reaction to Interiors (the autobiographical element), and is also a comic portrait of a consciously exaggerated celebrity lifestyle. 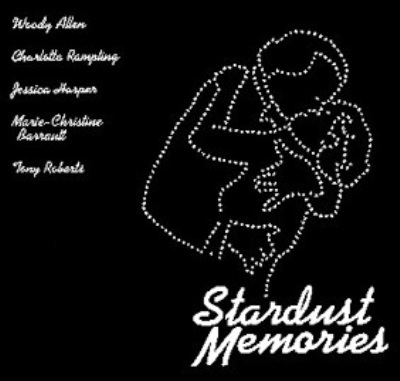 Like his later film Deconstructing Harry (in which Allen plays a writer who encounters the characters from his own fiction in his real life, intercut with dramatic recreations of his novels), Stardust Memories is a post-modern blend of narrative and narrative-within-narrative. It's like a 'Chinese box', beginning with a scene from Sandy's new film, then showing Sandy himself, and frequently switching to dream sequences and scenes from Sandy's other work. The two films also employ jump-cuts in some scenes, an otherwise rare device in Allen's work. There are some very funny lines. When Sandy complains that he doesn't want to make another comedy, his producer tries to convince him otherwise: "They want laughs in Kansas City, they've been working in the wheat fields all day". When he's stuck in traffic, he asks: "Is the Pope in town, or some other showbusiness figure?". Interestingly, the famous Eddie Adams photograph of the execution of Nguyen Van Lem is blown up to wall-size in Sandy's apartment, to reflect the character's depressed state of mind. Is it a pretentious film? Yes. Is it as good as his early, funny films? No. But the confusing layers of reality are justified by a revelation at the end: we learn that the entire film has itself been Sandy's creation, and we see the 'actors' watching themselves at the premiere and commenting on their performances. The original version of King Kong is stunning. The megalomaniacal Dino de Laurentiis attempted to remake it in the 1970s, and failed spectacularly. Peter Jackson must be even more of a megalomaniac if he believed he could succeed where de Laurentiis failed. Personally, I can never see the point of remakes or cover-versions. If you admire a film or song so much, why feel the need to change it? Jackson says he was inspired by the original King Kong as a child, and he now wants his own version to similarly inspire the next generation of children. Surely his Lord Of The Rings trilogy is already a huge inspiration to young children today? And if children are seriously interested in filmmaking they will surely admire the original version of King Kong provided that they have exposure to it. Jackson's King Kong reportedly cost $207,000,000 to produce, making it the most expensive film ever made (although, if adjusted for inflation, the most expensive film is still Cleopatra, itself a remake). Instead, why not spend a fraction of that inflated budget on a worldwide theatrical rerelease of the original version? Yes, it would be less commercially viable, though less money would be risked because a new film would not actually be made. John Cleese once said that he had spoken to a film producer and asked him what was the most difficult type of film to market to a multiplex audience. The answer was: anything original. Audiences like formulas, they like genre conventions, and they like actors playing to type. So remakes and sequels are guaranteed box-office successes. Watching the original King Kong, I constantly asked myself: "How the hell did they do that?". Watching Jackson's remake, I kept asking myself: "How much of this is CGI?". The panoramas and vertigo-inducing helicopter shots look spectacular, yet they are devalued because of the film's reliance upon CGI. Kong is entirely computer-generated, as are the dinosaurs, etc. on Skull island. Kong himself is a convincing CG creation, though many other effects look articifial (when the actors are in rowing-boats, it's obvious that the sea and surroundings are CG). The CG dinosaurs in Jurassic Park were amazing, though why, years later, are CG dinosaurs being churned out left, right, and centre? Has CGI not yet moved on from the resurrection of extinct species? The film is almost three hours long, and the time whizzes by, so it's certainly entertaining, though you would think that, with such a long running-time available, the plot would have fewer holes. For example, Carl announces that he has "come into possession of a map", though how it came into his possession is never questioned or revealed. The back-stories of Ann (the previous disappointments in her life) and Jimmy (his quasi-feral early life) are both hinted at, though never disclosed. Jack rescues Ann from Kong single-handedly, because they love each other, though when they return to New York they are inexplicably apart. Heart Of Darkness is one of my favourite novels [though I admit I probably have more dictionaries than novels! ], and it was very powerful as the source for Apocalypse Now. But referencing it in adventure films has become a bit of a cliche now, so the not-too-subtle inclusion of it in the new King Kong is not necessary. The scene that formed the centrepiece of the trailer for Jackson's film, in which Carl tells Ann: "Scream for your life!" 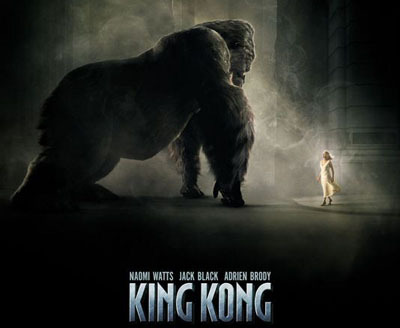 (a scene taken from the original version of King Kong) is not included in the final cut (or the extended director's cut). However, there is a subtle reference to the original film at the start, when it is explained that "Fay" is working on an RKO film with "Cooper": Fay Wray (the 'scream-queen' of the original film), King Kong's original studio, and Merian C Cooper (its co-director). 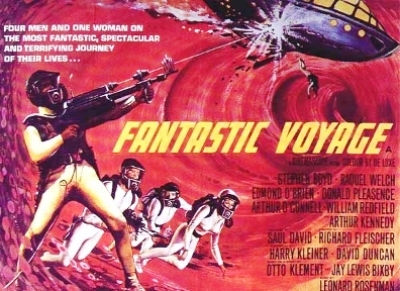 Fantastic Voyage, by Richard Fleischer, was one of the other in-flight movies on the return flight to Bangkok last week. I remember Innerspace (a Fantastic Voyage spoof) as one of my favourite childhood films, though I had never seen the original Fantastic Voyage itself. The title was surely inspired by Jules Verne. Exactly a century previously, Verne wrote about fantastical, then-impossible expeditions: Voyage To The Centre Of The Earth and Around The World In Eighty Days. A few years ago, I wrote a paper, Fascination Beneath The Surface, comparing the fictional voyages of Verne to the subcutaneous photographs of artists like Gilbert and George. Fantastic Voyage is a natural progression from Verne, and it long predates Gilbert and George. (It arguably influenced them because it shows an equally iridescent, abstract view of our insides.) The film shows blood corpuscles as if they were oils in a lava lamp, for instance. Now, endoscopic imaging can place cameras inside a real human body, and Mona Hatoum has turned her own endoscopy examination into video art, coming as close as is currently possible to a documentary version of Fantastic Voyage. Fantastic Voyage has an incredible concept: the miniaturisation of a team of scientists in a submarine, surgically injected into a man's body in order to remove a potentially fatal blood clot. What is surprising is that it makes no bones about the fact that this concept is all it has to offer. There is only a brief exposition at the start, hinting at a Cold War sub-plot in the vaguest possible terms. The purpose of the miniaturised rescue mission is to remove the blood clot in order that the man can regain consciousness and divulge a state secret, though the film ends abruptly as soon as the miniature scientists emerge from the man's body. We are not told if the man survived, what his secret was, or even if he was able to pass it on, as if the film itself admits that they were merely plot devices to serve the concept. On the plane back to Bangkok, one of the in-flight movies was Quentin Tarantino's Kill Bill II, which I hadn't seen before. I saw Kill Bill I when it was released, though I wasn't overkeen on it because of the constant martial arts. I'm not an especially big fan of kung-fu films, so I didn't go to see Kill Bill II. Having finally seen it on the plane, I was surprised by how stylistically different it is to the first film. The martial arts elements are much less prevalent, and there's much more of Tarantino's typically witty dialogue. Some of his trademark shots are included, as usual (a low-angle point-of-view: Budd and Ernie looking down at the Bride; a sequence replayed from two different perspectives: Elle driving up to Budd's trailer). The fourth edition of A History Of Graphic Design has been published in the US (and in the UK later this year). 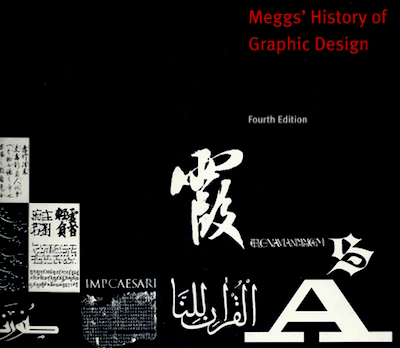 The previous editions were all written by Philip B Meggs, though following his death this new edition (retitled Meggs' History Of Graphic Design) has been revised and updated by Alston W Purvis. There are very few books on graphic design history (literally only a handful), and Meggs's book has always been regarded as the most comprehensive on the subject, tracing graphic art from prehistory to the present day. It's not only the definitive history of graphic design, it's one of the essential books on the history of art. Rainer Crone, the author of the German book Still Moving Pictures, has now written an English-language book on the same topic, Stanley Kubrick: Drama & Shadows. Both are studies of Kubrick's brief career as a Look magazine photographer. Kubrick worked for Look between 1945-1950. Still Moving Pictures was useful because it reprinted some of Kubrick's best Look photo-essays exactly as they originally appeared in the magazine, including a bibliography listing the magazine's headlines and dates of publication. Crone's new book, Drama & Shadows, is partly better and partly worse than the old one. It's better because, rather than reprinting previously-published images, it features Kubrick's contact-sheets, which have never been published before. However, it doesn't include a proper bibliography, so it's not clear which photo-essays these contact-sheets relate to. So, as a collection of previously-unpublished images by Kubrick, Drama & Shadows is excellent. The images are beautifully printed, though the text is too heavy on theory but too light on bibliographic context. Kubrick's former personal assistant, Anthony Frewin, has written a book called Are We Alone? : The Stanley Kubrick Extraterrestrial-Intelligence Interviews. The title is a little misleading: the interviews in the book were commissioned by Kubrick, though they are not interviews with Kubrick. Kubrick's original intention, when filming 2001: A Space Odyssey, was to begin it with a prologue in which the world's leading scientists discussed the film's cosmological themes. To this end, he sent Roger Caras around the world with a 35mm movie camera, to interview various scientists. In the end, Kubrick did not use the interviews in the finished film, and they have subsequently been lost. All that survives is a written transcript of each interview, and it is these transcripts that constitute the bulk of Frewin's book. The interview transcripts have already been published, albeit in an edited form, in Jerome Agel's out-of-print The Making Of Kubrick's 2001, a fact that Frewin only mentions in the briefest possible way in his bibliography. Also, most of Frewin's introduction has previously been published (as 2001: The Prologue That Nearly Was) in the Frankfurt Kubrick exhibition catalogue.